I am really excited to announce the availability of Tableau Server in the Azure Marketplace. Tableau offers analytics software and services to help people see and understand their data. 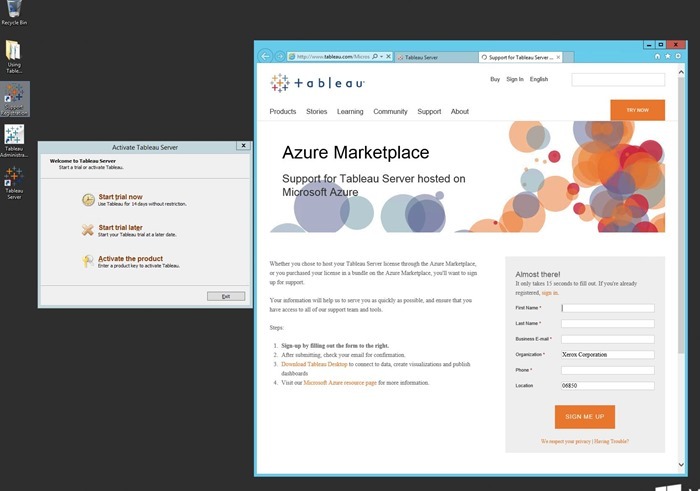 Tableau offers a portfolio of products like Tableau Desktop, Tableau Server and Tableau Online – and now, Azure Marketplace hosts a pre-installed and pre-configured VM with Tableau Server. To get going with Tableau, you can simply go to the Azure Portal in the Azure Marketplace and search for Tableau. From here, you will discover a simple step-by-step experience to deploy the server. After following the install steps, just log into the machine. From there, choose the options that make sense for your deployment and get going, whether starting a trial or activating the product. Once configured, do make sure you enable port 80 to be able to access the VM from the internet and add users to access the server. You are now ready to publish datasets, workbooks, and configure data-sources. For more information, see How to Publish Workbooks to a Tableau Server in the Tableau documentation. Tableau not only enables deep integration with Azure SQL Data Warehouse and Spark Service on Azure HDInsight. Tableau also offers AzureAD integration for Tableau Server (on-premise or cloud) and Tableau Online. These server instances allow you to sign-in to your subscriptions across all three environments using single federated identity. Have fun working on your data!